When will be Ronnie O'Sullivan's American Hustle next episode air date? Is Ronnie O'Sullivan's American Hustle renewed or cancelled? Where to countdown Ronnie O'Sullivan's American Hustle air dates? Is Ronnie O'Sullivan's American Hustle worth watching? Meet your new history teachers, snooker legend Ronnie O'Sullivan and sports broadcaster Matt Smith, as they cross the pond to explore America's 300 year history with the game of pool. The real-life mates travel the US to hunt down America's most notorious pool hustlers while meeting a few characters along the way. Snooker legend Ronnie O'Sullivan and sports broadcaster Matt Smith cross the pond to explore America's 300 year history with pool. This time, the duo hit New York. Ronnie and Matt's road trip continues in Chicago, where the snooker champion faces off with one of the game's deadliest players, 'Black Widow' Jeanette Lee. Ronnie and Matt hit the birthplace of the blues on the latest leg of their epic US tour – starting with the Graceland home of Elvis Presley – but will Ronnie be allowed to play on the King's own pool table? Elsewhere in this fascinating town they learn some inspiring lessons in the Civil Rights Museum and make a top-class pool-cue with a maestro of the craft. On the tables, an attempt to hustle the locals might just backfire – before Ronnie risks a sting in the tale from a man they call ‘The Scorpion' – one of the greatest players in pool history. Ronnie Matt hit the streets of San Francisco in a Steve McQueen-style '68 Mustang to try to hustle the locals – with some sleight of hand from Ronnie – before he plays pool against one of the game's biggest ever money-earners. Along the way, they train with local NFL team the 49ers, check out the cyber-future of pool in nearby Silicon Valley – with disastrous results – and get the shocking real story of life behind bars at notorious former prison Alcatraz, from an inspiring ex-guard. 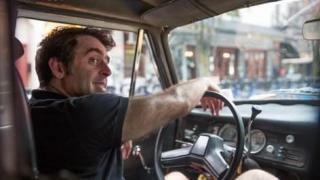 Ronnie O'Sullivan's American Hustle next episode air date provides TVMaze for you. EpisoDate.com is your TV show guide to Countdown Ronnie O'Sullivan's American Hustle Episode Air Dates and to stay in touch with Ronnie O'Sullivan's American Hustle next episode Air Date and your others favorite TV Shows. Add the shows you like to a "Watchlist" and let the site take it from there.